In general I target a 10% annualised rate of return, so by that measure this investment was a success. It also taught me some useful lessons which I think are almost as important. ICAP PLC is a FTSE 100 company with a market cap of around £3 billion. It’s the world’s largest interdealer broker which means that, among other things, it enables companies such as banks to carry out trades in a range of wholesale financial markets. These markets cover financial instruments such as foreign exchange rates, interest rates, commodities, debt and equities. Trades are handled either electronically, manually (known as “voice” broking) or a mixture of both. In very simple terms, the more traders buy and sell the more profit ICAP makes. When I bought ICAP In April 2012 the company was already facing difficulties and uncertainties. Trading volumes were beginning to fall and ICAP’s revenues and earnings were expected to fall along with them. This reduction in volume was driven partly by the Euro crisis, partly from banks reducing their trading activities after the financial crisis and partly from uncertainty over a range of new and tighter financial market regulation. As a consequence investors were worried about ICAP’s growth prospects to such an extent that its dividend yield was over 5%. That was far higher than the market average, which indicated a significant degree of fear in the market that the dividend would be cut. However, almost 3 years later those headwinds have begun to fade, the dividend hasn’t been cut and the shares have seen a healthy re-rating. As a result I’m now looking to lock in recent capital gains (on top of handsome dividends already paid out) and move on to another company. ICAP PLC was a potential investment for me because of all the usual reasons: it was a market-leading company with a strong balance sheet and a very strong and consistent track record of profitable dividend growth. At the same time it was facing some problems, as I’ve just mentioned, where its past record of growth looked unlikely to be repeated in 2012. Taken together that was a considerably more attractive combination of growth, quality, value and dividend yield than the average UK-listed company. The main question for me was whether or not the dividend could be sustained in the face of falling wholesale trading volumes. If ICAP’s problems were short lived then the dividend looked safe, but if its problems persisted for too many years then even 365p per share may have been too much to pay. As with any investment in the stock market the outcome was not guaranteed, but after looking at ICAP and its dominant position as the world’s leading interdealer broker I thought the odds of it being a value trap were acceptably small. On that basis I added it to my personal portfolio and the UKVI model portfolio in April 2012, with a position size of 3.2% (approximately 1/30th of the total). As usual my expectation was that I would be invested in ICAP for somewhere between one and ten years, or thereabouts, depending on how events unfolded. The first year was nothing to write home about. 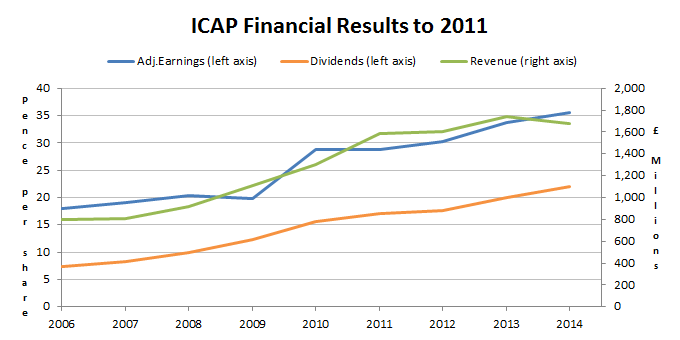 ICAP’s 2012 annual results were published in May 2012 and they were generally positive. The dividend was increased by more than 10% while revenues and profits were flat or slightly down. After that initially good start the company’s announcements became steadily more negative. By the 2013 half year results revenues and earnings were down more than 10% and 20% respectively. Michael Spencer, CEO, said, “This has been one of the toughest periods in my 36 year career in the wholesale financial markets”, blaming a whole host of external factors. The company’s focus now turned to cost cutting rather than expansion. Unsurprisingly the market was disappointed with the way things were going and the share price fell almost 25% from where I’d bought it. Many investors would have sold at that point, concluding that ICAP was a value trap and that the original decision to buy was wrong. However, generally I think it’s a mistake to sell and lock in losses just because the share price has fallen. My preferred approach is to ignore the share price on the assumption that it merely reflects the opinions of other investors. I prefer to focus on what the company is doing to turn things around, and also to think about where both it and its share price could be several years from now. Having done that after each quarterly announcement ICAP still looked attractive and so selling at a 25% loss was not something that crossed my mind. As the months rolled by the company’s cost cutting efforts continued and when the 2013 annual results were announced in May 2013 the dividend was maintained, despite falls in both revenues and earnings. In May 2014 the story in the annual results was the same: Times were extremely tough, but ICAP was cutting costs, treading water and holding the dividend steady. At that point the dividend yield relative to the purchase price was 6%, so in effect I was being paid 6% a year to wait for either the company to get going again or for other investors to push the share price up until it reached an attractive exit point. In the end it was the second scenario which came true. During the second half of 2014 the share price started to climb as falling oil prices and Swiss central bankers drove fear, uncertainty and trading volumes higher. By last week the share price had reached 467p, some 70% higher than its lows of 2012 and 2013 and some 27% above the price at which I’d bought it. 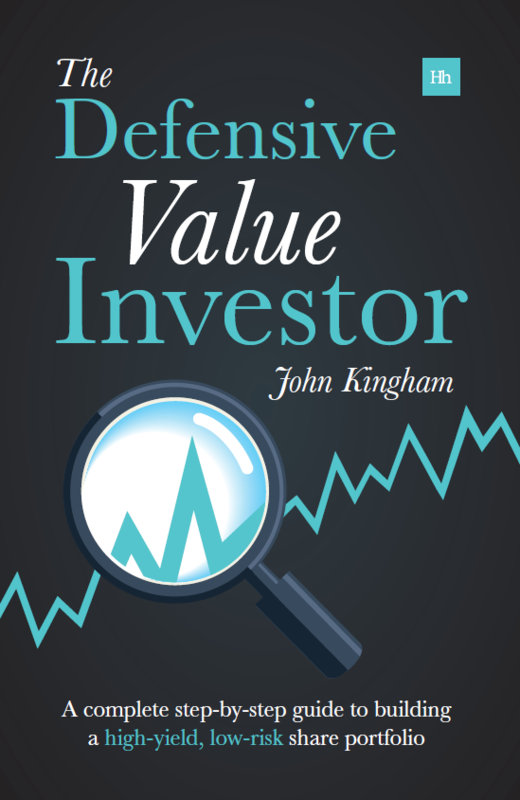 At one price a company (or a car, or a house) is attractively valued, at another price it is fairly valued and at yet another price it will be overvalued, or at least no longer cheap. For me ICAP now falls into the second or third category, while I only want to own investments in the first category. Although the dividend yield is still quite attractive and well above the market average, ICAP’s stats are not as good as they were in 2012. Quite a few other companies now have a better combination of growth/quality/value/yield. In fact ICAP now ranks at number 100 on my stock screen which makes it the weakest holding, on that basis, in my portfolio. I do not know what will happen in the future. 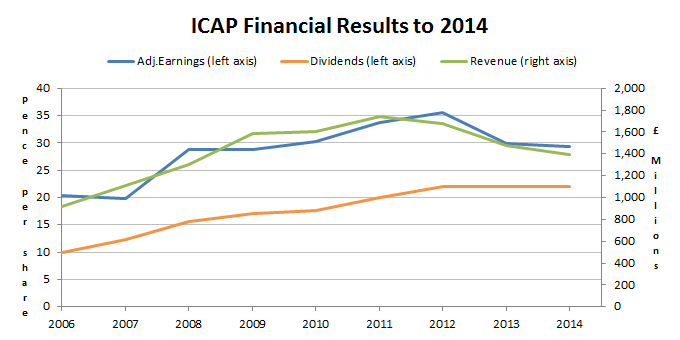 Perhaps ICAP will return to growth sooner rather than later and increase its dividend in 2015. Perhaps the share price will double from where it is today; I simply do not know. But not knowing doesn’t worry me as nobody else knows either. All I can go on are the company’s past results, its current share price and how both of those compare to what else the market has to offer. For me ICAP no longer appears to be a potentially outstanding investment, although it may still be a reasonable investment. And so, primarily for that reason, I sold it last week and will reinvest the proceeds into a new and more attractively valued company next month. 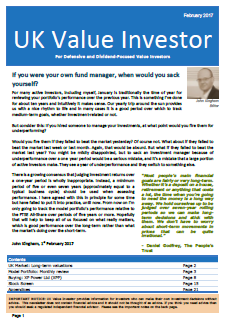 Note: You can read the full pre-purchase review of ICAP in the April 2012 issue of UK Value Investor (PDF). ….I have a friend that works there. Admittedly he’s a small cog in a small specialised corner but he describes a scene of bored brokers waiting for the phone to ring, trying desperately to think of ways to facilitate the regulatory/capital/funding issues of big banks in order to get some revenues in the door before more restructuring (=redundancies) get implemented. Although I didn’t really touch on it in the article, one of the advantages (although I hate to think of it in those terms) of brokerage firms is that their cost base is very flexible because it mostly walks on two legs. ICAP’s revenue declines would have led to huge losses for a company like Tesco, which has a much higher proportion of fixed costs, but ICAP can just make more brokers redundant and hey-presto, profits and dividends are maintained. As an ex-IT man I’ve been on the other end of that process as well. It’s good for top management and shareholders but much less so for those at the coalface. A good point. Most brokers have relatively low base salaries (compared to other financial services job) and tend to be paid most of their earnings via bonuses, which again as you point out keeps the cost base low, even if they’re not laid off. Nice trade John, and a jolly good story. A bit of a white knuckle ride around April 2013 on your chart, but all came good in the end. I commented on this as I just did a similar, yet much shorter timeframe trade on Tullet Prebon, another interdealer broker and got 15% + divi in 6 months — decided to leave it for reasons spelled out clearly by “under the money tree” here. Hi LR, I currently hold Tullett Prebon as its numbers are a little better than ICAP’s (using my particular metrics of course, it could look worse by someone else’s measure). As for DS Smith it’s way down the list and appears to have far too much debt for my liking. Not one I’ll be investing in any time soon I think, but well done with the 14% return in such a short period. I think I tend to have a slightly longer time-horizon than you as I almost never hold a company for just 6 months. It does occasionally happen if the share price rockets up, but generally I count my holding period in years rather than months. I guess as active investors go I’m at the less active end of the spectrum! John – Thanks for the comments on DS Smith, this was an aberration on my normal pattern – 100% with you that long term holdings are important and constitute probably 80% of my small pile of bricks. Tullet has legs, I probably exited too soon. Still a bird in the — as they say. Sold Unilever at 2941 and so far watching the fallout due to Greek uncertainty. Sensible decision. That’s some fall in the growth quality! I love how you described the overall story of owning this share from beginning to end, it’s a really good lesson in analysis, and patience. I’m always a bit wary about any stocks related to financial dealings, and as a rule generally don’t invest in them. I know people who work in many similar companies, and ICAP ate not alone in having bored brokers hanging around. Financial companies are certainly a bit trickier than trading companies. However firms like ICAP and Tullett Prebon are (in my non-expert opinion) more like a mixture of brokers in other fields (like stock brokers or ship brokers) and software/technology companies than they are like banks and insurance companies. So I’m happy to invest with due care and attention, but if one of them bites me I’ll lay out all the gory details as part of my usual post-sale autopsy. Thanks for the insight & opinion. Your posts are always a good read and thought provoking, especially when about one of my own holdings! 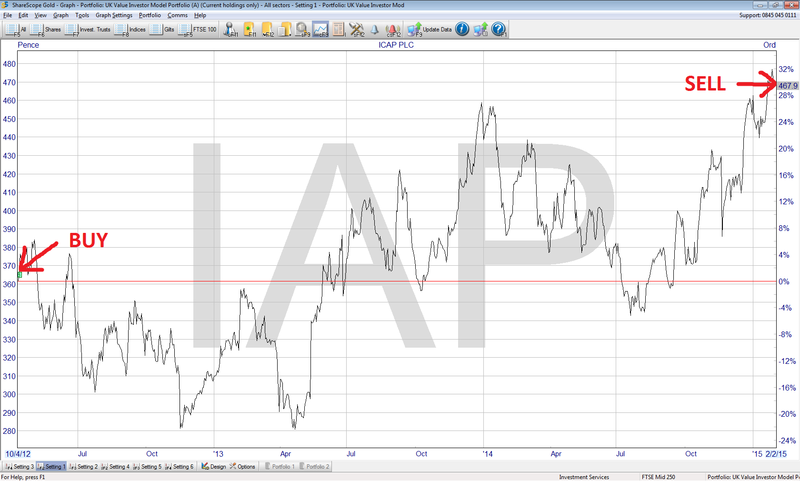 ICAP is amber on my sell screen, mainly due to div cover and free cash flow, so I’m on the fence. I’ve held since May 2012, so a bit longer than you. Your timing is more profitable than mine! Like you say none of us can predict the future, so I’ll probably stay on the fence unless the price goes up, or I get more up to date fundamentals. As I said at the end I don’t think ICAP is expensive. It’s ranked at 100 on my screen while the All-Share is at 171 (largely due to non-existent earnings/dividend growth over the last decade). So I think it’s a reasonable holding with a good yield and probably reasonable prospects, but just going by my method it was my weakest link. I think as long as the yield is above the market yield it’s probably reasonably priced, but of course your own timing of buy and sells is up to you. Can you please provide me the details of how you calculate the annualized return? I use an “internal rate of return” (IRR) calculation which is available in MS Excel as the function XIRR. If you have the dates and amounts of all the various cash inflow and outflow from an investment then you can calculate the IRR. So for ICAP I enter the amount and date of the original investment, then the amounts and dates of each dividend payment, then the amount and date of the sale proceeds.